Here’s another history walk–a short one this time at .6 of a mile–that will take you around the perimeter of the Pearson Farm, one of the earliest settlements in this area, dating to 1875. The starting point for this one is easy: the Pearson Pine at NE 29th and Fremont. Go stand under its broad branches and be prepared for time travel back through our neighborhood’s past. Before you walk the farm, though, there are a few things you need to know. The Pearson Ponderosa Pine presides over the corner of NE 29th and Fremont. About the Tree: This old timer has seen it all-the farms and orchards south of Fremont; the deep forest on the ridge to the north and the flats beyond that give way to the Columbia; the slow but steady reach of the street grid; an explosion of home building; construction of nearby Alameda School; the steady tide of young families moving in, and older people moving out. Like a sentinel, this tree has watched our corner of Portland grow up. Planted in 1885 by Samuel Pearson to mark the northeast corner of his 20-acre farm, this Ponderosa pine has had plenty of room to grow to its noteworthy circumference of 15 feet, and estimated height of more than 100 feet. According to a family story handed down the years, Samuel salvaged the young seedling from an area burned by wildfire and brought it home to his farm. We nominated this as a Heritage Tree back in 2008. 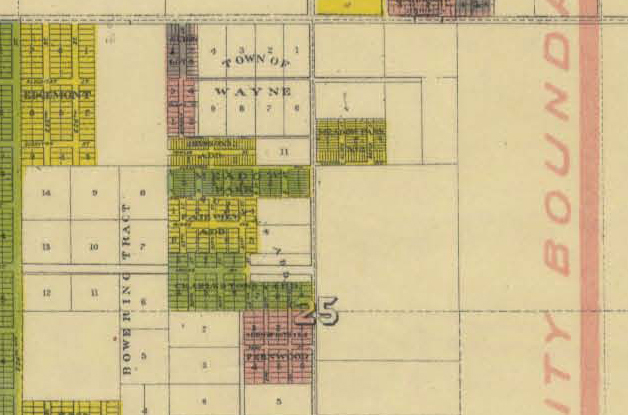 This detail from a much larger map shows the area of the Pearson farm in 1906. NE Fremont runs across the top of the frame. NE 33rd is the main road running vertically through the middle. NE 24th runs vertically on the far left side, along the edge of Edgemont. Look carefully and you can see Klickitat and Siskiyou streets. Note the Bowering Tract. The Pearson Farm is the empty lot east of Edgemont and west of the Town of Wayne. Note our proximity to the city limits: the pink vertical line on the far right shows the boundary. The large number “25” is section 25 in Township 1 North, Range 1 East of the Willamette Meridian. Click the map for a large image. Do you have that mental picture in mind now? OK, let’s walk. Start on Northeast 29th and Fremont, under the Pearson Pine, and head south on 29th for two blocks to Siskiyou. Along the way, you’ll note an empty lot on the right a few houses south on 29th…until two years ago, this held an original Pearson house. Turn right (west) on Siskiyou. You are now walking through what was a major wetland feature and pond, maybe a seasonal creek. If you look carefully, you can see what looks like a low spot in the pavement. Where they drained the swamp. You can also see the streets don’t line up just right here…a clue to the meeting of two developments. Continue on Siskiyou to Northeast 27th. You’ve just walked past a sawmill and small log yard. Can you hear the cows? Turn right (north) on 27th and appreciate the nice plaza and grounds at Alameda Elementary School. The pasture was off to your right where the playground is today. Check out the red farmhouse on your left as you approach Fremont. The third generation of Pearsons were born here and played on the porch. One of the Pearsons once said that porch was built extra large so the kids had a place to play outside that wasn’t in the cow pasture. In that day–1908–there was no school yet, no street, no sidewalk. Just a view of Mt. Hood and their pasture off the front porch to the east, and 20 acres of Scotch broom and dogwood out the back door. Turn right (east) on Fremont and set your sights on that big Ponderosa pine, back to where you started. Much has changed in this place since the Pearsons first shaped the landscape. But the power of memory, and the silent witness of that tall pine, remind us all about our neighborhood’s connection to those early years. I am a great great granddaughter of Samuel Pearson and am very interested in any family history I can find as our branch of the family tree is now very small. I had always heard about the farm and have pictures/Oregonian articles of my dad and his sister standing at the front door of the Alameda Grade School doors back in 1940.
Who is your Great Grandfather,Father, Aunt, etc? My Great,Great Granfather is also Samuel Pearson. My Grandmother is Violet Pearson.